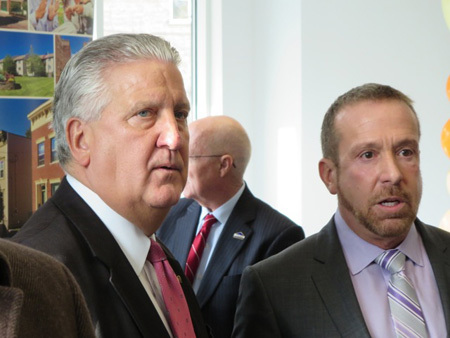 There used to be a big gaping hole on South Pearl Street, an intolerable political embarrassment that had to be disposed of before Albany mayor Jerry Jennings could leave office at the end of this year. Back on December 16 there was a little ceremony down there at the corner of South Pearl and Fourth Avenue to announce that both the hole and the embarrassment were officially gone, erased from human memory. Well, not completely. Okay, technically it wasn’t Jerry’s last ribbon cutting, for instance on His last Friday in office he cut the ribbon for some newly renovated downtown drinking establishment. 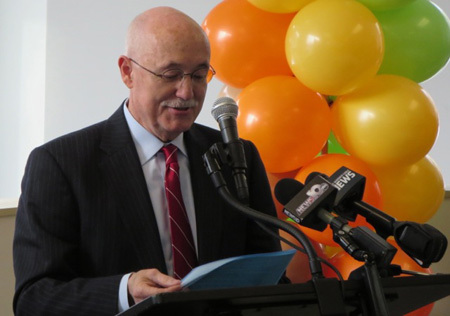 But this was His last official ribbon cutting, the last time in His capacity as mayor that He ceremoniously dedicated something useful that the City had produced with our tax dollars. You absolutely know I had to be there to witness this bright and positive closing act in this sordid affair. A small irrational part of me was worried that Jerry would be pointedly rude to me, I mean, He doesn’t have to play the game anymore so He doesn’t have to be nice to people that He detests. Of course I had nothing to worry about, everyone’s battles with His administration were done and for this event everybody left their grudges at home, or kept them to themselves. I was immediately struck with how good He looked, like His old self. During the four years of His last term He looked progressively more tired and... old. 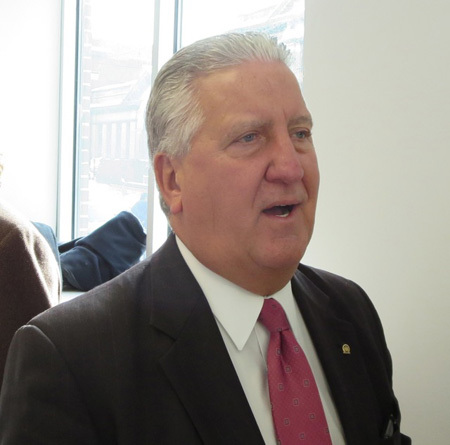 It started around the time of His last election in 2009 when He lost control of the Albany Police, and last spring as our mayor-elect Kathy Sheehan was getting ready to tear Him a new one for Primary Day, His appearance was starting to look downright alarming. But today He looked like He had shed ten years. Shortly after He arrived in the big, sunny bright soon-to-be laundry room where the ceremony was taking place, the two of us took a moment to face each other. We squared off, shook hands and I told Him quite sincerely that I thought he looked really good. He hesitated, I could see by His face that He was trying to figure out the underlying meaning of my statement. Of course there was none, I rarely say anything other than exactly what I mean, and I simply wanted Him to know that I thought he looked great. But I guess that’s what it’s like to be mayor, always on edge. Me, I couldn’t take it, it would kill me. Good feelings were the order of the day, I certainly wasn’t going to spoil the mood by mentioning the history behind why we were all gathered there. We were here to celebrate the completion of these fine three story buildings, excellent construction and impressive architecture. On this side of the street where we were gathered the newly constructed buildings were two story, which is more in line with the older buildings on this side. The upstairs are all apartments, the first floors looked like they could serve either as residences or as offices and retail shops. This section of South Pearl Street used to be one of the most important parts of the South End, a street defined by a collection of wonderful brick buildings, some of them dating back to the early 1800s. The most notable of them was located diagonally across South Pearl at the corner of Alexander Street, a four story building usually called the Knitting Factory. This beautiful edifice served at various times as a textile manufacturing facility and as a music hall for the South End’s despised German minority. After old Erastus Corning II (“The Mayor”) took power in 1942 (wait - how did he avoid the draft in WW2?) he quietly declared war on the South End, on the very people who had put him in office as mayor. By the time he dropped dead in 1983, still in office, the South End had become a shambles and its economy shattered. That’s Corning’s legacy. The buildings on this block, like much of South Pearl Street, were mostly abandoned. Corning’s successor Thomas Whalen continued the policy of neglect and economic suppression of the South End for some ten years, and when Jennings took over in 1994 this policy of suppression and demolition, if anything, was intensified. Meanwhile these wonderful buildings on South Pearl began to fall apart, the roofs leaked and the brick walls began to decay. But from what I’ve heard from reliable observers, none of them, including the Knitting Factory building, were beyond saving right up to the end, although certainly their revival had become an expensive proposition. 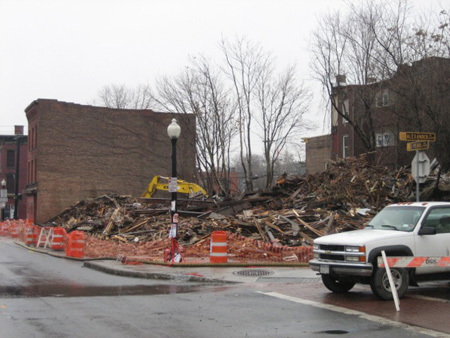 One night in February 2008, Jennings ordered half of the entire block destroyed at taxpayer expense. Suddenly the condition of these buildings had become an “emergency.” These unique and irreplaceable buildings were transformed into rubble and hauled off to the Rapp Road Dump in the Pine Bush. The sight of all those broken sticks and bricks was one of the saddest things I’d ever seen, I was reduced to spitting with rage. 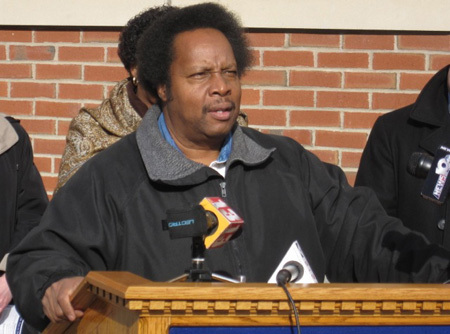 Jennings was caught by surprise by the firestorm of negative public reaction. He had taken all the standard precautions, for example He had sent DiTonno Demolition out at 9PM on a Friday so that no one was around to watch. That also effectively kept the news out of the local corporate media, which is so ineffective and their personnel so lazy that anything that happens off-hours in Albany is considered not to be newsworthy. A week or so before the attack Jennings sent the usual batch of Fire Department chiefs through the buildings to declare them a public hazard. 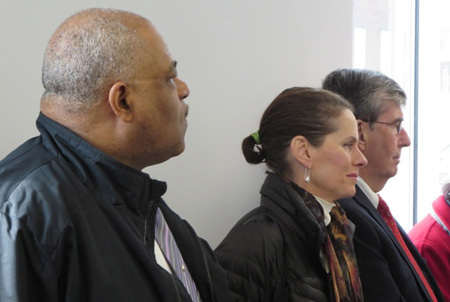 He was also careful to send Susan Holland into the building with the chiefs, she’s the director of an NGO called Historic Albany Foundation (HAF.) At this time Holland was cooperating quite closely with Jennings, she later reported that she had looked around inside the Knitting Factory building and declared that it was beyond saving. But I believe that neither the fire chiefs nor Holland could be called independent unbiased observers, I have heard of no corroborating evidence to confirm their assessment of the condition of the Knitting Factory. In any case, nothing is beyond saving if it’s still standing. Back in the 1970s when I lived on Hudson Avenue below Dove Street, I watched masons rebuild entire three story brick walls right in place. This is when exactly half the buildings on my block of Hudson Avenue were vacant (I counted them) and you should go look at those great old buildings today and check out how much they sell for. Holland became wildly furious at me for daring to question her questionable endorsement of the midnight wrecking of the Knitting Factory block. Like I’ve recently said, for some reason I seem to attract such people. Perhaps she ought to have channeled all this childish hate for me into trying to abate Albany’s housing crisis. But alas, I doubt that HAF will ever do anything other than opportunistically feed off the housing crisis until it gets a new director. Holland actually showed up at this ceremony on the 16th, but she was smart enough to stay very low key. Around the corner from here on Alexander Street there was, until recently, another embarrassing political hole in the streetscape. In September 2007, five months before the overnight attack on South Pearl, the City used a flimsy excuse to conduct a daylight attack against the neighborhood, conducted in daylight because there was no way the City could hide from the long time established residents of the street. Seven buildings in a row were wrecked, and later several more were destroyed, turning a street with several vacant buildings into a bombed-out war zone. Morris Morton of Alexander Street, of the venerable Mortons of the South End and former longtime president of the board of South End Improvement Corporation (SEIC) described the attack as “a feeding frenzy.” The destruction started when one house that had sat vacant for a long time suddenly started spilling water that leaked through the wall of the occupied house next door. Nevermind that the City had not turned off the municipal water feed to this vacant house, the general feeling on Alexander Street at the time was that the City had left it on deliberately. 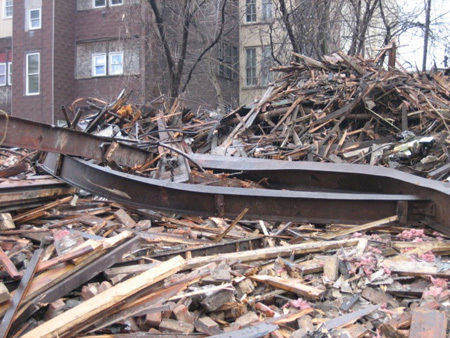 According to Mr. Morton, most of the the houses, all of which were built in the 1800s, should not have been wrecked. According to him, a couple of the houses had been stabilized by the owners and were slowly being worked on. 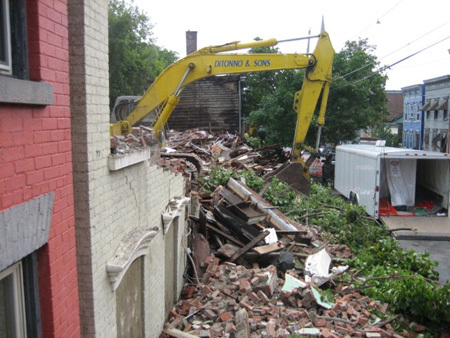 Apparently the only reason the wrecking crews didn’t tear down the entire block was because the owners of the next houses down the street stood firm and threatened legal action if the wreckers continued. And the family that owned and lived in the one occupied house was suddenly homeless. Too bad. After these two attacks Jerry Jennings had a whole raft of people angry at Him, not just nearby residents but all sorts of people concerned about His ongoing war against the buildings of the South End. Clearly the political landscape had shifted under His feet, no longer would taxpaying voters quietly accept His pattern of applied neglect followed by military style incursions designed to destroy the neighborhoods. He needed help to get out of these holes that He had dug for Himself. 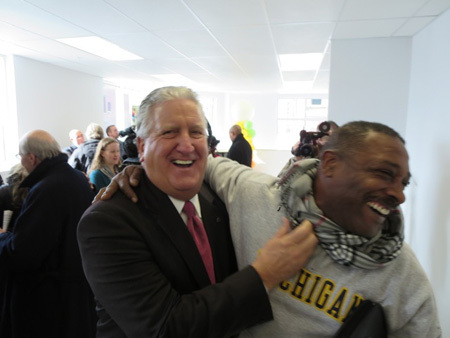 First, He turned to Habitat For Humanity Capital District, which under their able executive director Mike Jacobson has been building an effective organization that has been proving responsive to the needs of communities such as the South End which have suffered heavily under policies of applied neglect. So Habitat, which has been “brought in to partner with the City,” was given the task of building residential housing to fill in the gaping holes on Alexander Street. And with the angry residents of Alexander Street getting ready to demolish City Hall, Jennings needed fast results. And so Habitat delivered. In December of 2012 a row of two story houses with basement apartments that mostly resembled the nearby prevailing architecture were constructed on the bombed-out plot, and families were moved in immediately. While I have heard some mutterings about the quality of the construction, the fact is that the buildings look good, like they belong there. 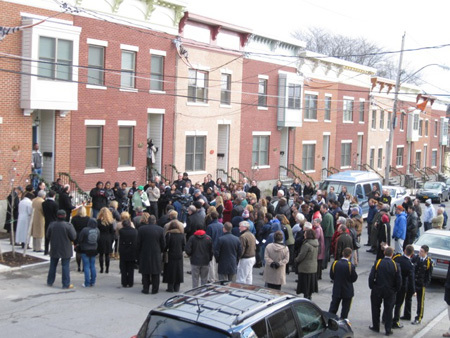 Habitat named the new buildings “Morton’s Walk” in honor of the people to whom Alexander Street mattered the most. 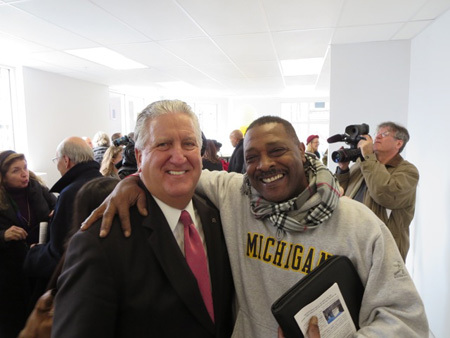 This reconstruction was a first for Jerry Jennings, the acknowledgment of the ongoing demand by the residents of Albany to rebuild their neighborhoods. I recall that at the time the City issued a defensive sounding statement about how the new buildings would almost immediately generate tax revenue where little or none was generated before. Coming late in His final term in office, I believe this was the first time the Jennings administration admitted that there is a link between housing and tax revenue. For the hole on South Pearl Street Jennings turned to the one man who could pull together a complete rebuilding of a section of a main thoroughfare in one project, Steve Longo of Albany Housing Authority (AHA.) 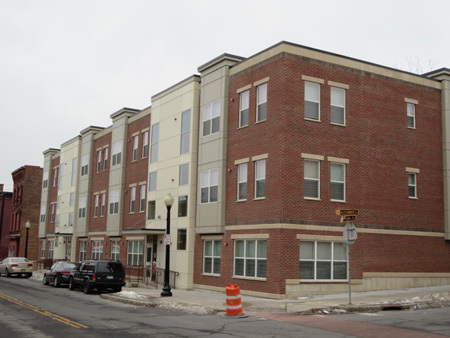 This is phase 3 of a 7 phase project for the South End, the creation of quality constructed public housing designed to jumpstart private investment. 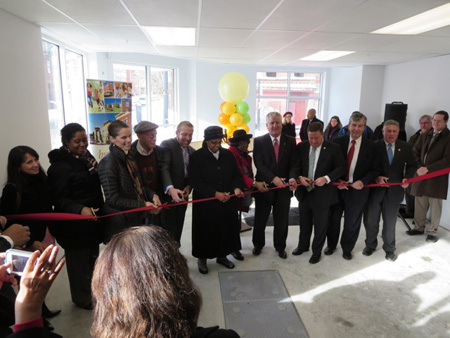 Phase 1 was centered around the Jared-Holt project near Broad and Clinton Streets, Phase 2 was the almost miraculous transformation of lower Morton Avenue. Mr. Longo (with invaluable help from his able and shy assistant Darren Scott) managed once again to find money from a variety of sources and create a funding package out of nothing. The new buildings, which properly front onto the sidewalk on both sides of the street, are not quite like anything else I’ve seen in Albany. It appears that Mr. Longo has developed enough confidence to experiment with style while still staying well within the requirements of traditional South End architecture. Well, not everything. 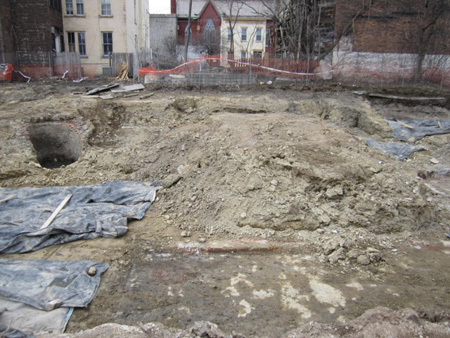 After Omni started digging the site of the former Knitting Factory, certain features were revealed that may have been part of an 1812 building that was built by an African church congregation, which would make it the site of Albany’s oldest black church. This fact was originally discovered by historian-at-large John Wolcott, and sure enough Mr. Wolcott was demanding an opportunity to look into the Omni dig and search for artifacts. For a while he raised a lot of hackles with his demands that construction work be stopped and archeological review be expanded. What was visible was the stone and mortar back cellar wall of the Knitting Factory, which may have been part of the original church and incorporated into the later building, and a round brick vat that may have been a cistern. With much respect to Mr. Wolcott, I think it more likely that these were remains of the private residence that was built on the site sometime after 1822. I find it unlikely that a group of free blacks in the early 1800s had the resources to build with stone and brick, in any case by 1822 the congregation had moved to another location. Still, promises were made to Mr. Wolcott that a historical marker would be set on the corner of Alexander and South Pearl to mark this important location, which he felt was hardly adequate as he was hoping for much more digging for artifacts. I hope that our elected leaders have not forgotten about the marker. While it is certainly impractical to turn the entire South End into a museum, we certainly can designate those places that are historically important to the people who live in the neighborhood. Is that private investment money starting to arrive in the South End? According to Darren Scott, the remaining unrenovated houses along lower Morton Avenue are being bought and worked on, “in play” for the first time in thirty or so years. But he did ask me to help spread word that investment opportunities are available. I know from personal experience that if you want to start with nothing and work your way up, then South End real estate is the place you want to look. But like the old song says, you’d better hurry ‘cause it’s going fast. 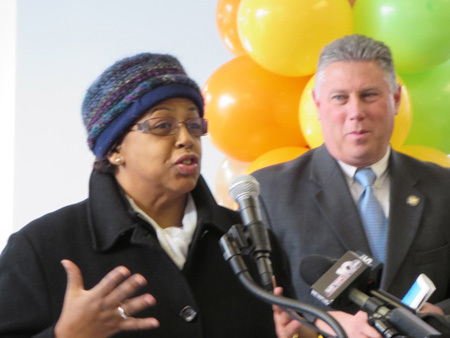 One person who was notably absent was mayor-elect Kathy Sheehan, which I thought was a good discreet move on her part. This was Jerry’s moment, her presence would have been awkward to say the least. It could have been simply that she was home relaxing before her four years of constant work were to begin, but perhaps this was an indication that she comes into office with the requisite political skills that will make her a successful mayor. After Ms. Sheehan takes office I expect that there will be a radical realignment of housing policy, starting with the Building and Codes Department and reaching into every corner of the City. The mayor-elect clearly understands that link between housing and a balanced budget, and fiscal solvency is her biggest concern. I just hope she leaves Steve Longo in place doing what he’s doing, he’s an asset that we need to keep. There wasn’t much corporate media present, no surprise there. 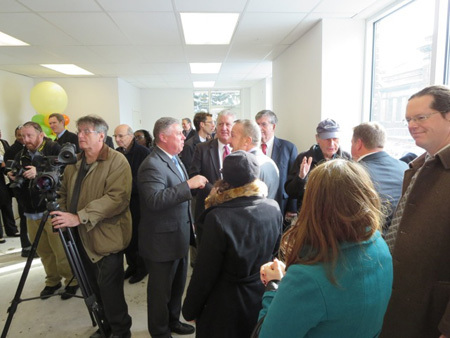 Days later the content providers all came out to see the ribbon cutting at the downtown bar and ran extensive segments on that, but this tale of rebuilding South Pearl Street is not the sort of thing these suburbanites want to report about Albany. Unless I missed it, the only questions they asked of any of the elected officials present was to mayor Jennings about the recent snowstorm. But because it is run by corporations, the local corporate media has never reported on the real reason why the South End fell into such a dire, run down state in the first place. The reason for this mess is that for a long time the government failed to govern. City Hall refused to return any of the taxes that they extracted from the community and in fact consistently refused to carry out most of the responsibilities that only government is capable of doing. For some reason we have been accepting this neglect as if we were not worthy of better. 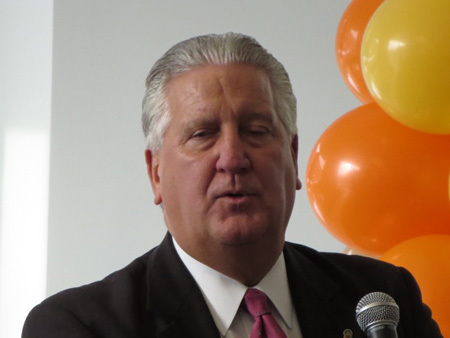 In the last few years of His 20 year reign, Jerry Jennings tried to quickly make up for His policy of applied neglect with these rebuilding projects. But until then He had no plans to reverse the destructive policies instituted by Erastus Corning, at least not until He started to worry about His legacy. In a sense, Erastus Corning never died, he held on to the office of mayor into the second decade of the 21st Century. Erastus Corning II finally leaves office on January 1, 2014 and hopefully his evil ghost will never return to haunt us. The citizens of Albany are looking forward to having a government that governs for the first time in decades. It is said that The People get the government that they deserve, let us see if we have developed some self-respect. Dan, Erastus Corning was drafted in 1944 and turned down a deferment that he was entitled to take as a Mayor of a large city. He went as an enlisted man, eschewing any favoritism that a graduate of an Ivy League college might expect. He served overseas, saw action in Europe and returned to Albany. Al - The great god Wikipedia says it is so. Corning was drafted and went overseas, and a Council member was acting mayor while he was gone. I stand corrected for my offhand comment that I didn't bother to double-check.